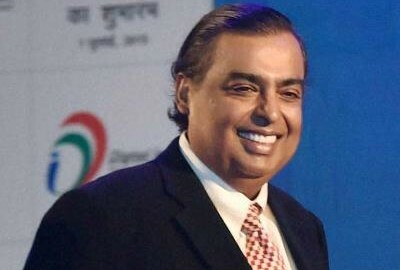 New Delhi: Mukesh Ambani, Sunday said Reliance Jio will be ready to commercially launch 4G telecom services in 2016, offering 80 per cent of Indians high-speed mobile internet as well as voice services. “We are ready to launch (4G services) and in the second half of 2016, 80% of India’s population will have high-speed mobile broadband Internet. So 80% of India’s 1.3 billion Indians will have high-speed mobile Internet,” RIL chairman Mukesh Ambani told CNN International’s Fareed Zakaria. “So 80 percent of the 1.3 billion Indians will have high-speed, mobile internet. And by 2017, we would cover 90 per cent. And by 2018, all of India would be covered by this digital infrastructure,” he said in an interview. Reliance Jio Infocomm Ltd (R-Jio)’s 4G services are currently available to roughly 120,000 employees, their families and business partners. The firm, a unit of Reliance Industries Ltd, has invested close to USD 15 billion in the telecom venture so far. R-Jio holds the highest amount of liberalised (free to use for any service) spectrum among telecom operators, totalling 51.1 MHz across the 800 MHz, 1,800 MHz and 2,300 MHz bands. Zakaria travelled from New York to Mumbai to meet Ambani at his residence Antilia. He is the only person to have interviewed Ambani twice. “And in the next 20 years, in a network society, we are going to have change much more than what we have seen in the last hundred years,” he said. Ambani said digitisation will be at the forefront of the digital revolution and India cannot be left behind. “As we saw in the year 2012-13, India is 150th in the world in mobile broadband penetration as well as quality. And Jio has really been conceived to change this position,” he said. Citing the example of US, where 4G services were launched five years ago, he said major carriers today cover only 75 to 80 per cent of the market. “And we would be pretty much doing that in 2016 itself,” he said. RIL chairman and managing director said digital infrastructure is a very good investment. “For me personally, we made this investment just to make sure that the youth of India, which is still the bulk of India — India, as you know, is a very young country — is empowered, and they have an equal opportunity to not only prosper themselves, but to contribute to this new world. “And that was really a main reason. And that’s why we took very high risks,” he said. The investment with time “now looks like being pretty good even business-wise,” he added.